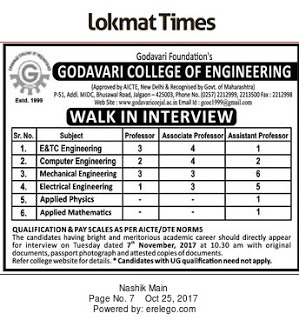 Godavari College of Engineering, Jalgaon has advertised in LOKMAT for the recruitment of Professor/Associate Professor/Assistant Professor jobs vacancies. Interested and eligible job aspirants are requested to walk-in on 07th November 2017 . Check out further more details below. College Profile: Godavari College of Engineering (GCOE) was started by Godavari Foundation in 1999 to impart quality education in the field of Engineering & Technology. Godavari College of Engineering is just one of the ventures of Godavari Foundation set up by person with high academic record at the behest of very young altruist Dr. Ulhas Patil in 1999 at Jalgaon. College is approved by AICTE, New Delhi; recognized by Govt. of Maharashtra and affiliated to North Maharashtra University, Jalgaon (NMU is UGC-NACC 4 star accredited University).